The tip of the Llyn Peninsula is awash with the remains of holy wells. A legacy they say of the sheer numbers of pilgrims who made their way to Bardsey Island in medieval times. Three visits to Bardsey were the equivalent in spiritual terms to one trip to Rome; although for many travellers the two journeys may have been equally as difficult. Bardsey, the site of a monastery to which the monks fled after the destruction of Bangor Is y Coed, was once renowned as the home of 20,000 saints, although the number is considered as being due to a misprint or mistranslation rather than any scientific census. 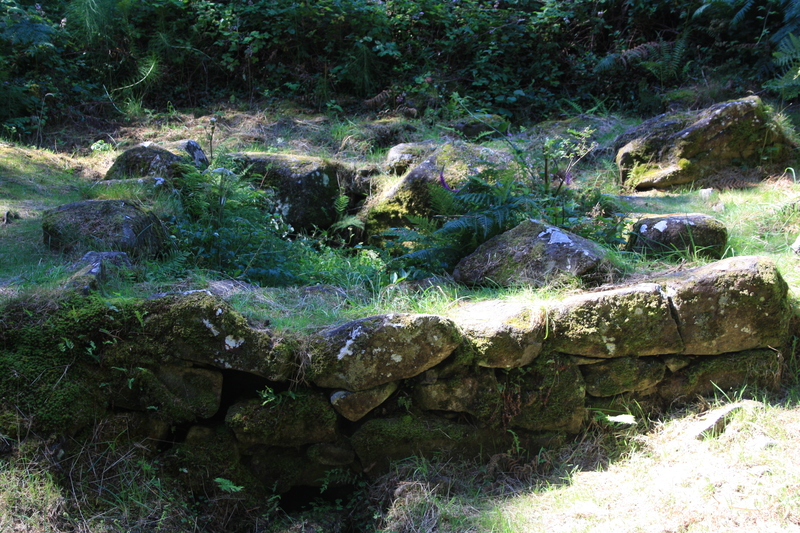 Still, just like the roadside gwasanaethau, the pilgrim trail was lined with all the facilities needed to sustain the weary traveller, and the chain of holy wells lying beside the paths, like medieval Costa coffee shops, are a lasting marker of the routes. 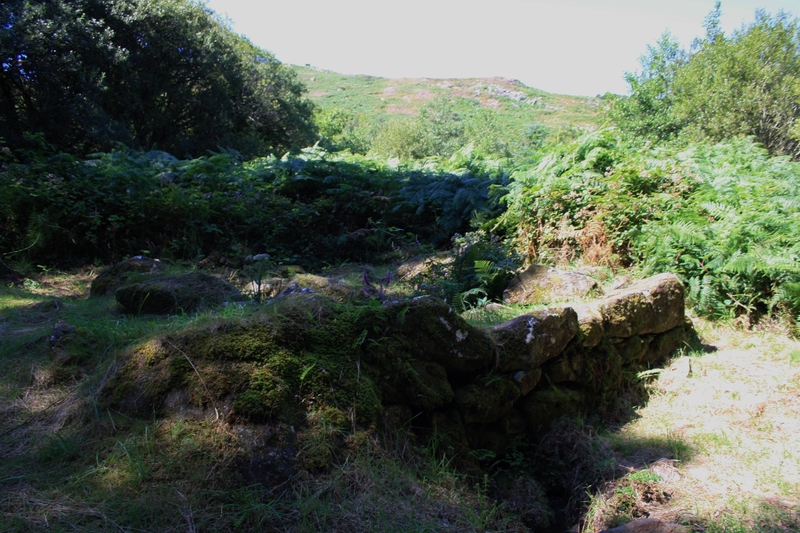 The final destination is almost in sight as you climb up through the woods on Bron Llwyd to Ffynnon y Saint – the Saint’s Well. We avoided the long walk the pilgrims took by parking at the National Trust house of Plas yn Rhiw, shhh, don’t tell them, I thought we would only be gone for half an hour but it turned into two and a half. 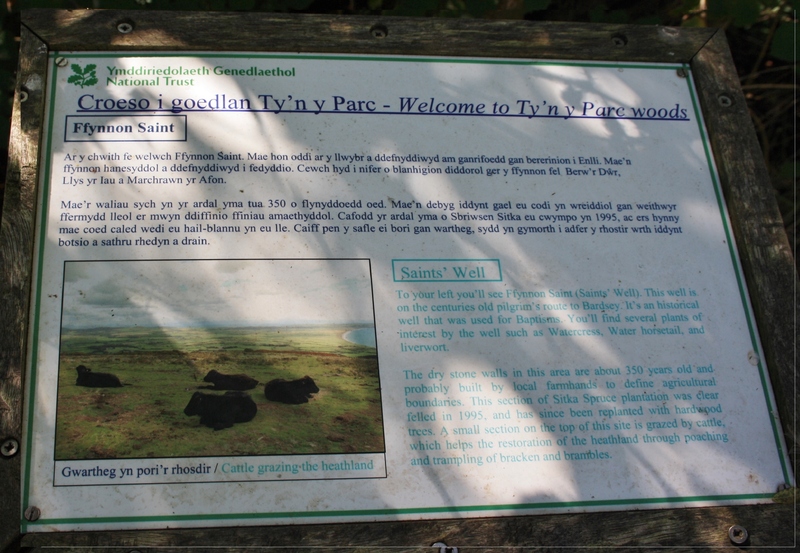 The maps show a footpath from Ty’n y Parc farm leading up the hillside to the well. Very soon the path fizzled out, becoming a very steep and slippery scramble alongside a stream. What the map didn’t show was that the track way past the farm and through the woods now extends gently and gradually up to the well making access so much easier; and by the gate at the top the incongruity of a National Trust interpretation board. We only discovered these on the way down. 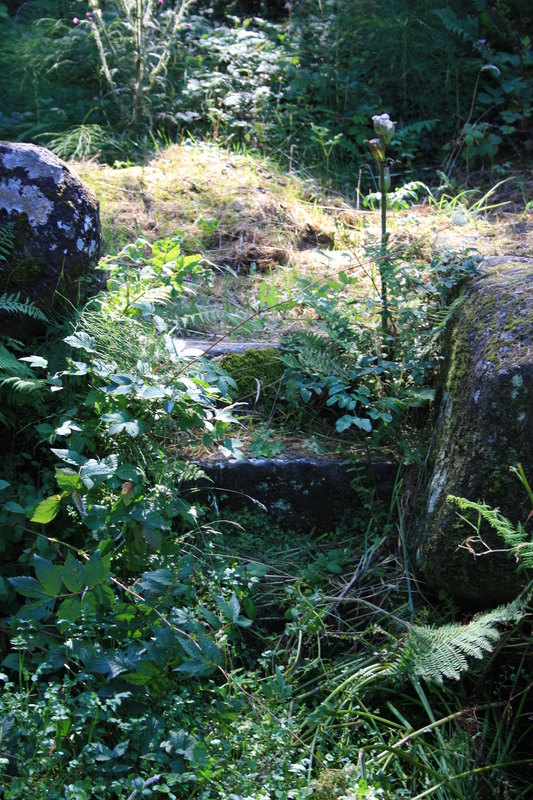 As with many of the wells we visited over the summer it was terribly overgrown with weed inside, although the spring could still be seen, within the basin and flowing out to the west forming a small trickle of a stream down the hillside. 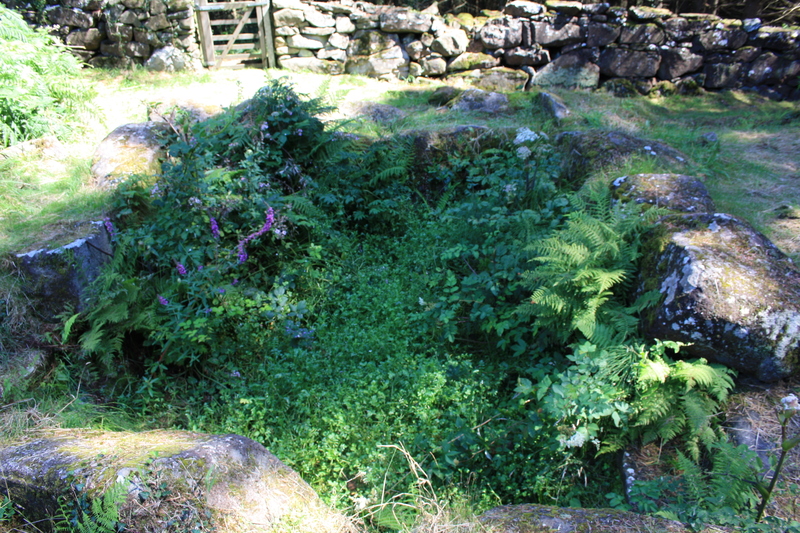 Myrddin Fardd records that in the nineteenth century, at least, the women of the area would visit the well early in the morning on Ascension Day to bathe their eyes in the water and offer pins. These two quotations appear to be the sum total of our knowledge of the history and tradition of Ffynnon y Saint. We did of course visit Plas yn Rhiw after retrieving the car, we always do. It is one of my favourite National trust properties, an ancient cottage on the hillside, sea views, steeply terraced gardens beside and below and wells and pilgrims in every direction.. One of those houses you could very easily imagine wanting to living in, despite the resident ghost. 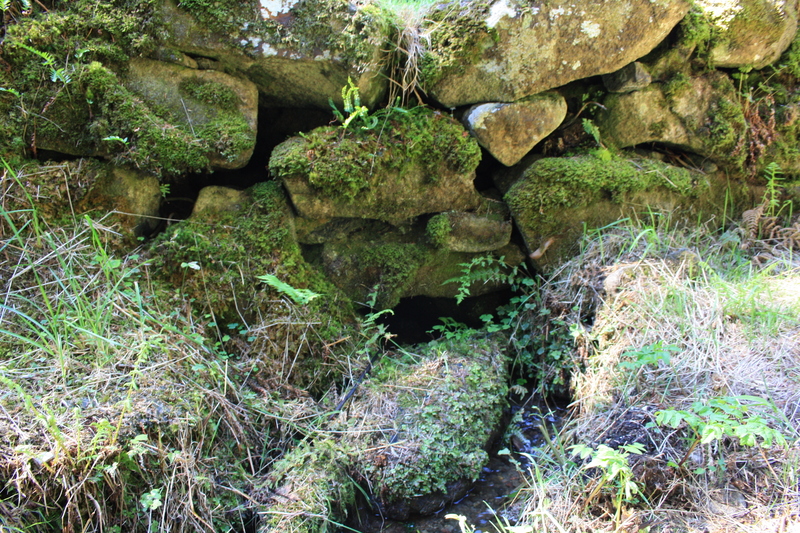 We revisited this site at the end of July 2016 and found that considerable work had been done to clear the well, the photos below show the transformation that has been achieved. thank you. It does make a very good walk..